It’s no secret the planet is awash in plastic trash, so anything we can do to avoid using single-use plastic items like bottles, straws, and bags is a win for both conserving resources and preventing pollution. By using a shampoo bar in lieu of bottled shampoo, you’ll get beautiful locks while reducing waste, and saving both natural resources and money. And by making your own shampoo bars and soaps, you’ll save even more money, and feel great about the safe, food-grade ingredients you are using to cleanse your hair and body. 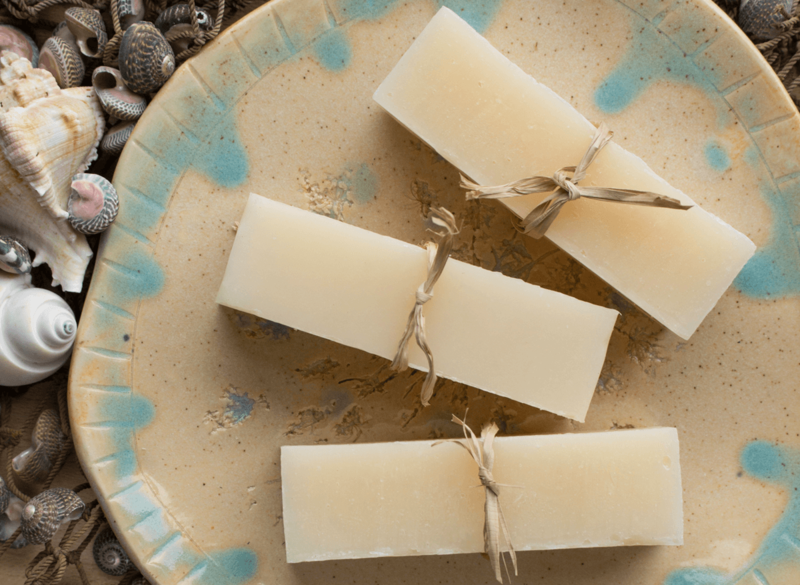 Soapmaking is a fun and practical hobby, as well as a valuable homesteading skill. Homemade soap also makes a gorgeous, affordable gift for almost any occasion. 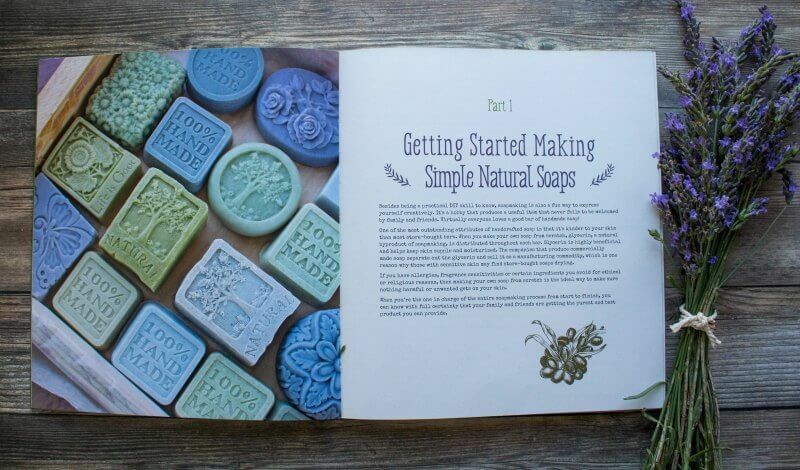 But even if you just want to dabble, my favorite book on the subject, Simple & Natural Soapmaking, is a very thorough resource for any brand-new soap maker, with fun ideas for someone with more experience as well. In her comprehensive guide, herbalist Jan Berry offers detailed tutorials and step-by-step photographs for making traditional cold-process soap and the more modern hot-process method with a slow cooker. There are 50 easy, unique soap recipes with ingredients and scents inspired by the herb garden, veggie garden, farm, forest and more. Below is one of my favorite shampoo bar recipes from her book. In this recipe, a double-strength lye solution is made first, using only half the amount of water that a regular soap recipe would normally use. Then coconut milk is added to the oils to make up the remaining liquid balance. With its high lauric acid content, coconut milk ensures this shampoo bar recipe has a bubbly lather and extra creamy feel, while jojoba oil adds a touch of luxury that’s fantastic for promoting healthy, shiny hair. Shampoo sticks are a fun alternative to the traditional bar-shaped soap made by simply cutting a regular shampoo bar into thirds. Their smaller size makes them easy to handle and convenient to use. Feel free to leave the bar uncut, but you’ll need extra curing time. 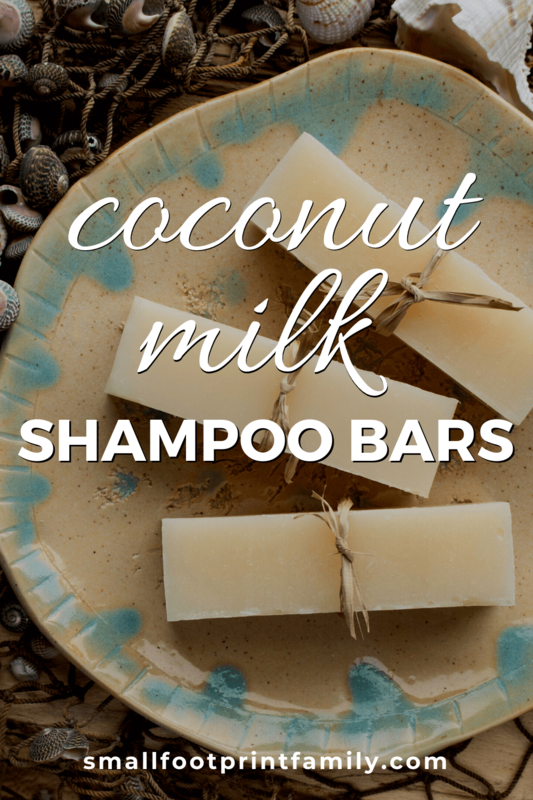 Coconut milk ensures this shampoo bar recipe has a bubbly lather and extra creamy feel, while jojoba oil adds a touch of luxury that’s fantastic for promoting healthy shiny hair. 1 oz jojoba oil (28 g) Substitution: If jojoba isn’t available, try substituting with more sunflower or sweet almond oil in its place. The lye amount will not need to be adjusted. Wearing protective gloves and eyewear, carefully stir the lye into the distilled water, then set the lye solution aside in a safe place to cool for about 30 to 40 minutes or until the temperature drops to around 100 to 110°F (38 to 43°C). Melt the coconut oil, then add to the other oils. Add the coconut milk to the warm oils and use an immersion blender for a few seconds until thoroughly combined. Pour into a prepared mold. Cover lightly with a sheet of wax or freezer paper, then a towel or light blanket. Peek at the soap every so often; if it starts developing a crack, uncover and move it to a cooler location. Keep the soap in the mold for 1 to 2 days, or until it's easy to remove, then slice it into bars when it's firm enough not to stick to your cutting tool. To make shampoo sticks, cut each bar into thirds. Cure on coated cooling racks or sheets of wax paper about 4 weeks before using. Excerpted with permission from Simple & Natural Soapmaking by Jan Berry. I am just about to make this, because I have everything I need, yayyyy! As a newbie shampoo bar maker, can I ask, can I add essential oils to this mixture? Is fresh coconut milk ok? Is there any difference in use between soap vs shampoo bars on hair? In that case, you’d freeze the coconut milk and use it along with the water in your lye solution, or you could use pure coconut milk in place of water. I can’t be certain how it behaves in soap though, but it sounds like a nice idea to try out! Trace shouldn’t take that long unless you’re hand stirring instead of using an immersion blender? I’ve not had that experience with organic and non-organic oils. Usually the temperatures affect trace (higher temperatures can speed things up) and total liquid amount (less liquid helps you reach trace faster.) Also if your lye has absorbed humidity from the air (you can see this by clumpy hard bits in the lye bottle) it won’t be as strong and can take a long time to reach trace. The only other thing I can think of is if one of the olive oils was cut with something like canola oil which slows down trace. But in that case the non-organic oil would be the slowest to reach trace. OR one more thought – if you use olive oil pomace (definitely not organic) it’s known to speed up trace quite a bit. Shampoo bars are very similar to soap recipe except they usually have a higher amount of castor oil for a better lather. Can I use the crockpot method with this recipe? Yes, it can be made hot process in a crockpot. In that case, I suggest adding an extra 1 to 1.5 ounces of additional water to the lye solution so it won’t dry out during cook time. Have you tried this using frozen coconut milk? I’m just worried that adding the 100 degree lye water to the oils containing the coconut milk will burn the milk. Have you found that happening? I’ve never used frozen coconut milk, but the recipe was well-tested before it was published in the book, and the milk does not burn. In the above recipe (coconut milk shampoo sticks) you did not say what temperature to heat the lye to. The lye naturally heats up when you stir it into water. Thanks Dawn, I did not know that the lye heats up when you stir it into water…I am just embarking on the world of shampoo soaps! Good luck to you on your soap-making adventures! Have fun with it! Have you tried this? How does it affect your hair in the long run? A general guideline for homemade soaps is around 1 year, but they can often last longer. Soap doesn’t spoil, but the oils within will eventually go rancid and the scents and colors may fade over time. If the soap smells like old or rancid oil, then it’s expired. Otherwise, it should be good to use! Yes, you can use olive pomace oil, just be aware that it tends to speed up the process so the soap may thicken & reach trace faster. It might also alter the color of the soap a little. However, most olive pomace oil is heavily contaminated with toxic polycyclic aromatic hydrocarbons (PAHs) like benzopyrene, so I recommend only minimally processed, food-grade ingredients on your skin. These would make a beautiful gift for those of us wanting to spread the green word this holiday season. Thanks for the idea!